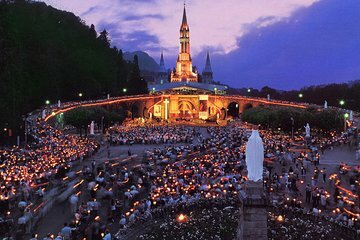 Experience a private three-day pilgrimage tour in Lourdes from Toulouse. Leave the logistics and details to your guides and have the peace of mind to focus on your visit to the Sanctuary of Our Lady of Lourdes, the, Grotto of Massabielle, and other sights. The tour includes round-trip transportation, two nights in a centrally located hotel, all meals, a private half-day tour of Lourdes, and candle light processions in the evening.